July 4th marked the opening of the Fleet #27 Racing Season on Truesdale Lake. Races are held every Sunday (2PM start time), rain or shine, starting across from the Gilbert Street Beach. Below is the race sheet, with detailed information and rules. 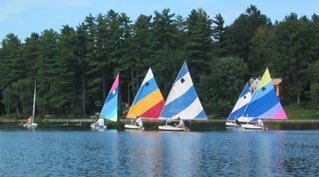 Results from prior year’s series’ can be found here: http://truesdalelake.com/boats/sunfish-fleet-27/. By next weekend I hope to have a new page for this year’s results, updated each week! A summer Sunfish series of 20 races will be held, with 2 races each Sunday, the first beginning at 2:00 p.m. Practice races will be held in June. The regular series on the 10 Sundays from July 4- September 5. (“President’s Cup special race on 9/6- Labor Day) Since we only count your best 10 races, you can win the series, and still miss 1/2 the races. If sufficient boats participate- two fleets will compete allowing beginners an easier learning experience otherwise beginners will also be given early starts and minimal rule enforcement. STARBOARD is the right side of the boat when you are looking forward. WHEN CHANGING TACKS and thus getting right of way, the other boat must be given room to get out of the way. RULE OF 720 DEGREES: if you foul another boat you must sail around in two complete circles (any size). For hints, other races etc join the International Sunfish Association -248 673-2750, check out www.sunfishclass.org or see Mark Patek.